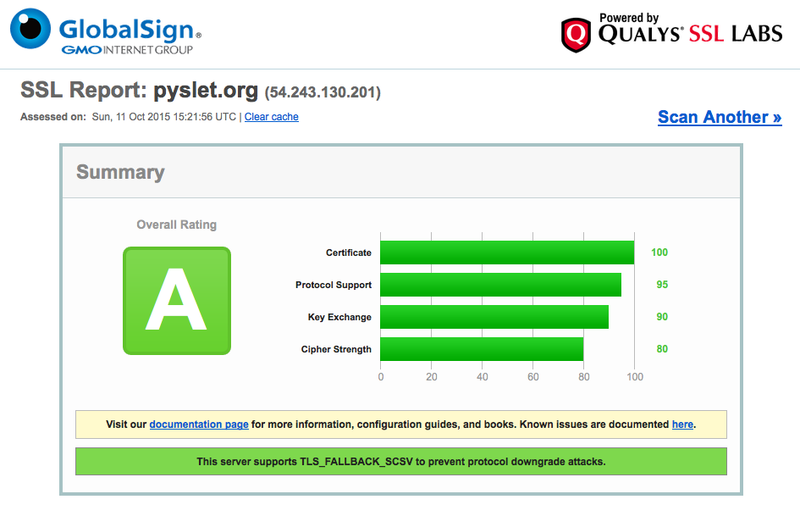 After months of being too busy to sort this out I have finally moved the Pyslet website to SSL. This is a quick post to explain how I've done this. OSI license: Pyslet uses the BSD 3-Clause License: check! Actively maintained: well, Pyslet is a spare-time activity but I'm going to give myself a qualified tick here. Not used for commercial purposes: the Pyslet website is just a way of hosting demos of Pyslet in action, no adverts, no 'monetization' of any kind: check! That last one is not quite as easy as you might think. Here's what I did to make it happen, I'll assume you have already dome some openssl magic, applied for and received your crt file. Download the intermediate certificate chain file from GlobalSign here, the default one for SHA-256 Orders was the correct one for me. The second file is the certificate I got from GlobalSign themselves. The third one is the intermediate certificate I downloaded above. This is a relatively simple configuration designed to get an A rating while not worrying too much about compatibility with really old browsers.